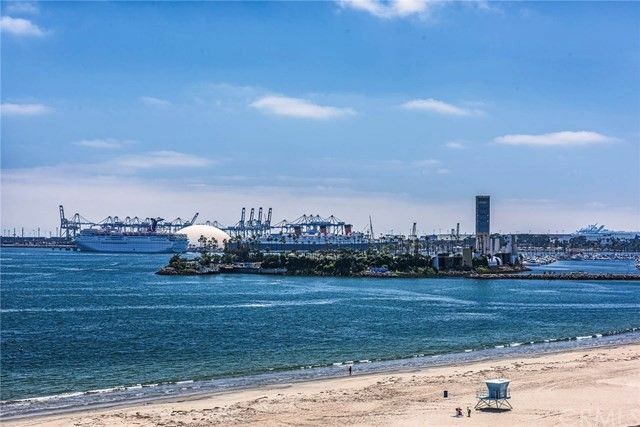 Located in one of Long Beach's most sought after beach front complexes, this Penthouse home in 1500 Ocean, being offered for resale for the 1st time, is sure to impress the most discriminating buyer! Located on the top floor with 11ft ceilings exclusive to this location,this top floor Penthouse home only shares one common wall and has panoramic blue water ocean views from Palos Verdes to Newport Beach including the Queen Mary,marina,Catalina Island and more! Come home everyday to the relaxing sounds of the waves below and enjoy secure direct beach access as well! This open floor plan is the largest in the complex and offers numerous quality upgrades that inlcude:Granite kitchen counter tops, stainless steel appliances,wood floor entry,hallway,and kitchen floors,master bath Jacuzzi tub and walk in shower with marble surrounds and dual marble vanity sinks,custom window coverings,gas appliances, freshly painted designer paint,and dual pane windows! This premiere residence also affords two wrap around balconies for plenty of outdoor living and entertaining! Pool,spa,rec. room,secure access,onsite gated guest parking,sundeck, outdoor cooking area, gym and more! Not to mention the home comes with 2 side by side parking spaces and a private storage room.